Carrots, broccoli, spinach, kale, sweet potatoes, mushrooms… the list goes on and on. While vegetables are one of the most important source of nutrients in our diet, they are often one of the least eaten of the food groups. Our taste pallet is drawn to sweet, salty and savory foods and vegetables on their own are often missing in all three of these categories. As a wife and mother of three I am often fighting to get more vegetables into the diets of my family. I am a huge fan of most vegetables and often can eat them plain and be quite content, my kids are not so easy. Over the years I have had to be creative and I am sure there are others out there who are trying to do the same thing or are looking for ways to create “healthier” foods for their family and friends. I wanted to share some of the successes I have had that I feel are benefiting the health of my little (and big) ones. Expand on ground turkey or beef: If you are making any dish with ground meat (tacos, meatloaf, meatballs, etc) add some shredded or finely chopped vegetables into the meat mixture. It adds a lot of vitamins and fiber and also helps keep the dish moist while cooking. I usually go through my produce drawer and find ones that need to be used or trashed. Why throw them out when you can hide them in your favorite dishes? 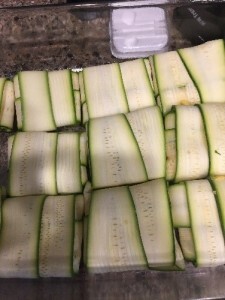 Cut out the pasta: Spiralize your sweet potatoes or squash into noodles or use your vegetable peeler to make thing strips for ravioli noodles. Either way, you reduce the calories in your dish while adding extra vitamins and minerals. Top with your favorite sauce. Check out our featured recipe here for a great twist on raviolis! The next time you hear someone say they don’t like vegetables, try adding them into the dishes you already make. You will be influencing their health in a positive way without them even knowing it! Do you have another creative way of increasing your meal’s veggie content? If so, PLEASE share with us!